At the beginning of this year, we were concerned about a potentially major error by the U.S. Federal Reserve (the Fed), and the implications of such an error on the global markets. 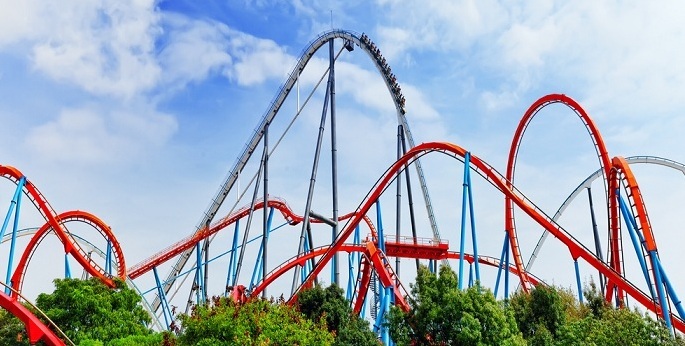 Large U.S. equity market drawdowns are typically associated with an economic recession. We think that economic recessions in the U.S. are usually caused by the Fed overtightening monetary conditions and choking off economic growth. Last fall and winter, the Fed was talking about raising interest rates, which we thought was problematic due to a combination of labor market slack and low market-based inflation expectations. 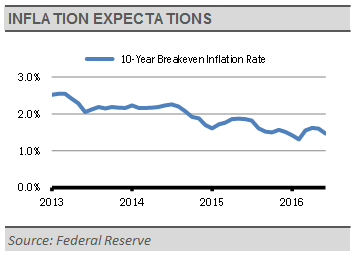 We continue to see labor market slack and low inflation expectations, but the Fed has now backed away from its interest rate hike rhetoric, which we take as a positive sign. We see labor market slack represented by a stubbornly wide gap between the headline unemployment rate (the U-3 rate), and the under-employment rate (the U-6) rate. Historically, the U-6 rate is approximately 1.8 times the U-3 rate. However, as the U-3 rate has fallen to pre-crisis levels, the U-6 rate has stalled. 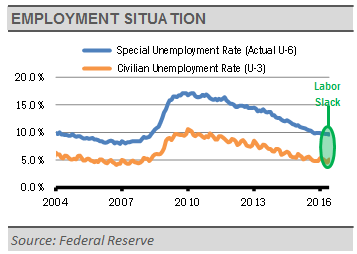 While the headline U-3 unemployment rate is down to 4.9%, the U-6 rate has recovered to 9.6%. Given the historical relationship between the unemployment and underemployment rates, we would expect the U-6 rate to be about 8.8%, or 0.8% lower, at this point. Furthermore, market-based inflation expectations, as measured by 10-Year Treasury Inflation Protected Securities (TIPS) breakeven spreads, continue to decline. As shown below, the market does not think that the Fed will come close to its 2% inflation target for years to come. With both labor market slack and low inflation expectations persistent, the Fed has plenty of room to let short-term interest rates remain at their current levels. Combined with the additional uncertainties stemming from the Brexit vote, we expect both the Fed and the Bank of England to delay any potential interest rate hikes, while the European Central Bank and the Bank of Japan may ease policy further. We do not think that the U.S. economy is in great shape, but it should continue to grow at a sluggish pace, so long as the Fed stays out of the way. Additionally, we expect nominal GDP, which we think is key to corporate revenue growth, to continue to grow near the low end of its post-financial crisis range.